Kiril Pejcinovic was educator who wrote his works in popular language and together with Joachim Krcovski represented the first generation of the contemporary Macedonian literature from the 19th century. 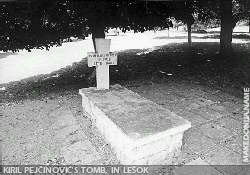 Kiril Pejcinovic was born in the village of Tearce by Tetovo, in 1771 and died in 1845 in Lesok. The "Epitaph" is Pejcinovic's latest work and represents biographical memoir written on his grave that says where he was born, educated and worked and where he wanted to be buried. It ends with the with the author's wish that he wants the future generations to remember him for his benevolence. 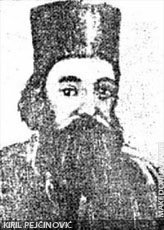 Kiril Pejcinovic used to work in the monastery that he built, by himself in Lesok, St. Atanasius and in the monastery of Marko, in Susica by Skopje. 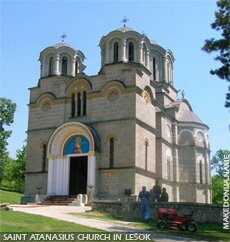 In 1817, Pejcinovic got a permission by the Abdurahman Pasha (Pasa - local representative of Ottoman authority) to restore the Lesok Monastery Saint Anastasius. Let God bless the work.